The deadline for completing your survey is 5pm on Friday 27th April. The Early Years Sector Profile, which Pobal has published for the last 15 years, is a definitive source of accurate and factual information on the sector. It is used to reflect the reality of current state of the Early Years sector each year. It is used to plan and highlight areas of work that might need attention and resources. The more services that fill it in the more reflective of the sector it becomes. The profile is up on PIP. In 2017 there was an 84% response rate and this year it is hoped to get a response rate of over 90%. If you have a question or need support please contact us and we will be happy to help. Services are asked to complete the service profile for each facility (i.e. one for each DCYA Reference). Make sure your service profile is included. Payment of €13 per hour, for up to 18 hours training will be payable on completion of one or both of these two courses, currently being offered by Better Start. In order to be eligible for payment, the courses must be fully completed (all modules) and attendance certified. Log onto your PIP Portal to view full announcement. Details on how to apply for payment and the payment process will be provided over the coming weeks. AIM Inclusive Play Packs are being delivered to ECCE settings nationwide over the coming weeks. These packs contain a set of sensory and educational play resources to support inclusive practice within pre-school settings. These resources support the development of coordination, audio, visual and tactile skills among all children, particularly children with a disability. The resources section of the accompanying website http://play.aim.give.ie/ allows you to select the type of skill that you wish to improve on such as Cognitive, Language, Literacy and Communication, Physical, Sensory or Social/Emotional. Details of how to use each resource can also be found on the website. Always Children First Child Protection training has been reviewed and updated to support the commencement of the Children First Act 2015. The training is FREE and places are limited to two per service and only available to persons working in Childcare in county Wicklow. To book a place on this course please complete our online booking form. 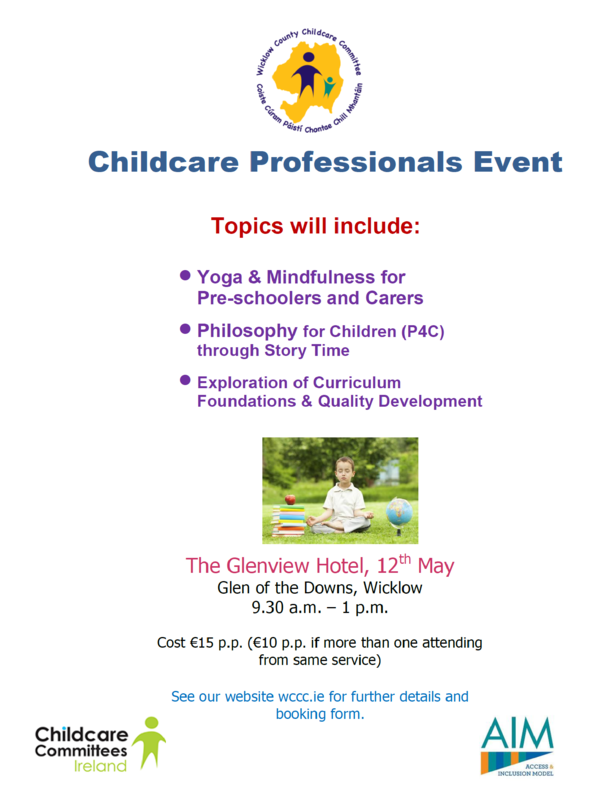 Following on from our very successful Childcare Professionals Day in November we are holding a mini Childcare Professionals Day on Saturday 12th of May in The Glenview Hotel 9.30am -1.00pm. The three one hour sessions will consist of Yoga for Children, Helping children to think and communicate well using the P4C approach (Philosophy for children) and Exploration of Curriculum Foundations within the context of Childrens art experiences. For further details about this event and booking form please see our website https://bit.ly/2GSiUXQ. Please ensure you enclose payment with your booking form.